Guwahati, Feb 9 : More than 10 people were detained from different parts of Guwahati today for alleged attempt to disrobe or obstruct Prime Minister Narendra Modi's convoy. Police said four youth were detained from near the Kamrup (M) deputy commissioner's office early in the morning, based on intelligence report that they would try to disrobe as a mark of protest against the Citizenship (Amendment) Bill, 2019. A few youths were also detained from near Bharalu and Satgaon area of the city for trying to obstruct the PM's convoy and wave black flags. The PM's convoy from the Raj Bhavan here to the Guwahati airport moved without any hindrance, police said. Prohibitory orders under CrPC section 144 have already been clamped in the city to prohibit any demonstration. 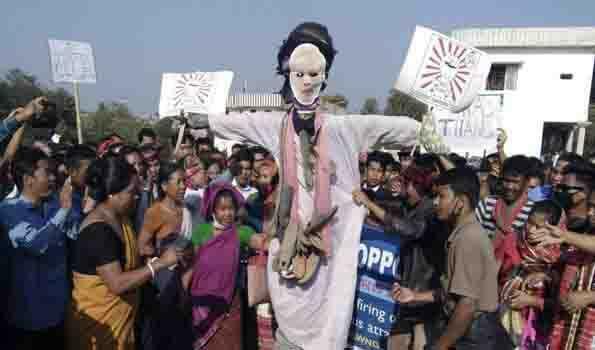 All Assam Students Union (AASU) had waved black flags at the PM on his arrival last evening and has lined up protests against Modi's visit today, including burning of the PM's effigies across the state. Meanwhile, a 12-hour statewide bandh called by Tai Ahom Yuba Parishad against the PM's visit disrupted life in eastern Assam parts. Modi had reached Guwahati last evening and spend the night at the Raj Bhavan, flying out to Arunachal Pradesh in the first leg of his NE trip this morning. He will be returning to Guwahati to attend a public rally on the outskirts later today, and then, proceed to Tripura for the final leg of his trip this evening. The Lok Sabha passed the Bill through a voice vote on January 8, but it is pending in the Rajya Sabha.